The Air Jordan XI Space Jam was the hot shoe of the year leading up to its release in late 2009, earning it the top spot of Sneaker News’ Top 30 Sneaker of 2009. 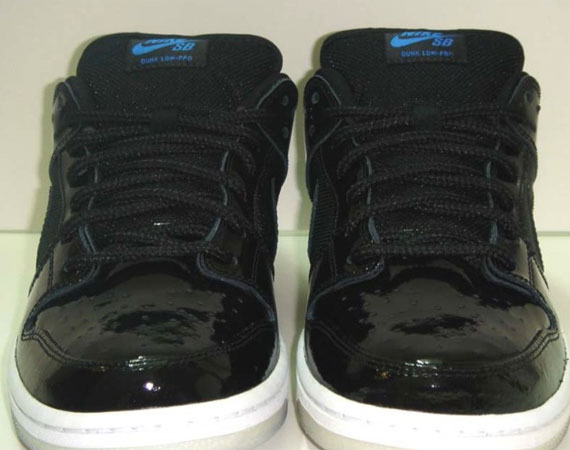 The Space Jam theme spilled over to 2010, as we saw a number of custom kicks, general release shoes, and even Air Force 1 Bespokes inspired by the gorgeous Air Jordan design, and for May 2011, Space Jam will touch down on the not-so-distant plane of Nike SB. 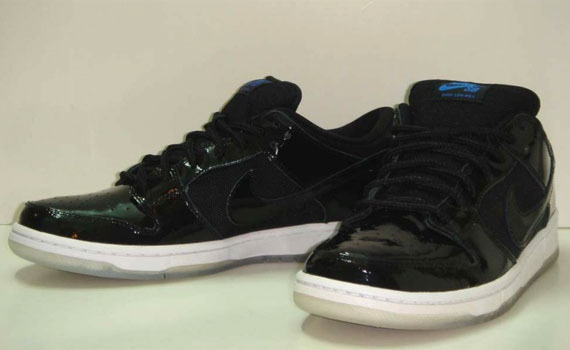 Here’s a look at the Nike SB Dunk Low ‘Space Jam’, featuring a black patent leather upper paired with black mesh, roped laces (as seen on the Air Jordan XI), blue typefont on the tongue label and heel, and a translucent ‘ice’ sole paired with a white midsole. These SB Dunk beauties are a dream come from true for those who love seeing ‘cross-over’ projects, and this is certainly the best Space Jam SB Dunk that could possibly be imagined.